It will mean that for the first time consumers will be able to purchase some of the Fab Four's most popular songs via the store. Apple and record label EMI have been in talks for years about getting the catalogue online. Apple chief executive and Beatles fan Steve Jobs said it had "been a long and winding road to get here". "We love the Beatles and are honoured and thrilled to welcome them to iTunes," he said. Sir Paul McCartney echoed his thoughts. "It's fantastic to see the songs we originally released on vinyl receive as much love in the digital world as they did the first time around," he said. Ringo Starr added: "I'm particularly glad to no longer be asked when the Beatles are coming to iTunes." But not everyone was convinced it was such a big deal. Writing in his blog, Mark Mulligan, an analyst with research firm Forrester, said it was not what the younger generation of digital music fans craved. "The fact that securing the content of a band old enough to be most young music fans' grandfathers is a sad reflection of the state of the digital music market," he said. "The digital music market needs new music products, not yesteryear's hits repackaged," he added. For years The Beatles' music label Apple Corps was involved in a bitter trademark dispute with Apple the computer company. The dispute was finally settled in 2007. Earlier in the year Sir Paul McCartney hinted that part of the delay in getting a deal with Apple was down to EMI. The Beatles catalogue has been a noticeable absence from the iTunes store despite the fact that solo works of members of the band are on sale there. There have been forays into the digital world for the band. Last year EMI released limited edition apple-shaped USB drives containing The Beatles' studio albums as digital files. And in September 2009, The Beatles: Rock Band video game was released. Even though the group formed around 50 years ago, they remain one of the top-selling bands in the world. Neilsen SoundScan reported that they have sold more than 30 million albums in the past decade. 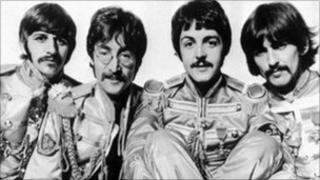 EMI has said that with worldwide sales of one billion albums, the Beatles are the top-selling band in music history. The deal with Apple comes amid uncertainty at EMI. The company's owner, private equity firm Terra Firma Capital Partners, owes millions in debt payments to Citigroup, which helped bankroll the purchase of EMI in 2007. Ben Rumley from Enders Analysis says the Beatles' arrival is as important for EMI as it is for consumers. "EMI will make some money selling The Beatles once again," he told BBC 6 Music. "The Beatles were about 10% of their sales in the US last year, excluding digital, so having The Beatles available online can clearly be a good thing. They're very good at exploiting them." The iTunes music store opened in 2003 and is now the largest music retailer in the world. The Beatles albums are available for purchase and download for £10.99 each, double albums for £17.99 and individual songs for 99p. A box set, containing all 13 remastered studio albums is available for £125. It includes the Beatles' very first US concert in its entirety. Will the Beatles go digital at last?